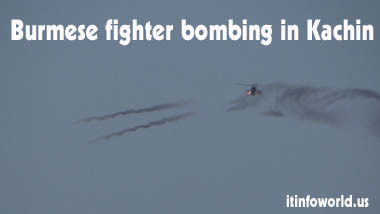 Burmese fighter bombing in Kachin Military aircraft are being attacked in the northern state of Burma, targeting the positions of the rebels in Kachin. From the description of the video of this incident and eyewitnesses, there is an idea that the Burmese military started a new operation there. This video, taken by a rescue organization named Free Burmese Rangers, shows that militant helicopters are fired on rebel positions in Kachin province. Military aircraft are being attacked in the northern state of Burma, targeting the positions of the rebels in Kachin. From the description of the video of this incident and eyewitnesses, there is an idea that the Burmese military started a new operation there. This video, taken by a rescue organization named Free Burmese Rangers, shows that militant helicopters are fired on rebel positions in Kachin province. In the area where the Kachin Independence Army headquarters were located for the last five years, there were jetties flying around the army forces near the rebel trench. Burmese President Thein Sien said that he commanded the army to fight only for the need of self-defense. President's Office Director told the BBC that they did not know anything about the air strikes and they are still trying to convince the rebels to negotiate peace talks. However, witnesses in the area confirmed the presence of jet aircraft and helicopter attack in the area. Freelance photographer Ryan Rocco, who is in Kachin, says he has seen the militants in the sky every day for the last 5 days. It is not clear how many people were killed in the last five days of air strikes. In the area where the fight is going on, many people have already fled to Kachin and camps in China's border areas. The fight for autonomy of Kachin province began in 171 after the ceasefire in 2011. BBC correspondent says 18 months ago 75 thousand people fled from the conflict after the conflict began. During the Kachin autonomy movement in 1988, Khin Omar was a leader of the movement in Burma. He is conducting movement from Thailand with democracy and human rights in Burma. He says that they are worried about Kachin's situation and the issue of denial of government attacks is more worrying. Phil Robertson of Human Rights Watch, Human Rights Watch, says that what is happening in Kachin proves that Burma's leaders have been given international acceptance and may have been a little rush to lift the ban, maybe a little longer. BBC correspondents say that this fight has raised questions about Burma's reform process now. In particular, President Thein Sein has promised the peace talks and reforms that the military has the support of him at all.